MainAll NewsInside IsraelRevisiting the Carmel Fire; what have we learned? Revisiting the Carmel Fire; what have we learned? Many people are still not aware of the damage of throwing a cigarette out the window, or forgetting to properly smother a campfire. It has been five years since Israel’s deadliest forest fire that destroyed large sections of the Carmel forest and killed 44 people. The fire which occurred on December 3rd, 2010 caused over 17,000 people to be evacuated from their homes. 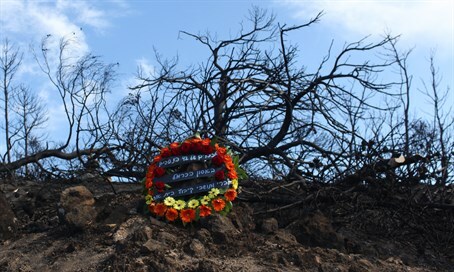 Dr. Shay Levy, renowned expert on the prevention of forest fires and Lecturer at both Haifa University, and Emek Israel College, spoke to Arutz Sheva about the current situation in the Carmel forest. Dr. Levy noted that forest fires have not ceased from the region, and that the majority of the fires in the area, albeit on a much larger scale, are caused by people. “Sometimes the fires are caused by negligence, of hikers, or drivers who carelessly throw a lit cigarette out of a window, and sometimes they are caused by arsonists. But the majority of the fires lit are handled very quickly and diligently by the Israel National Fire and Rescue Authority, and most of the time don’t become large scale fires,” he said. “For us living in a small country every fire, is harmful and every tree is sacred. “Whenever there is a fire, even a small one the result is that large forces of fire fighters are called in to prevent the fire from spreading.” This is in an effort to prevent a large scale fire such as the one from 2010 from occurring again. According to Levy, the most important thing for the general populace to do is to simply raise the level of awareness and hopefully decrease the amount of negligence among one another. “With strong winds, coals not smothered properly can cause a fire even two or three days later,” he said. Today, things are looking up for the Carmel region. If one visits the carmel now-a-days they will see that the vegetation has returned to the many of the areas damaged by the fire. Additionally, Keren Kayemet LeYisrael (KKL) and Israel Nature and Parks Authority have removed a lot of the vegetation and other elements that can be used as fuel for fires. One can also add to the list of positive changes in the area, the drastically improved fire prevention system of the fire department, and the attention they give to the forests around the Carmel region. But there is still more work to do. Levy also said that extreme weather conditions such as the heat that Israel suffered through this summer exasperates the situation even further. “This (high amounts of combustible vegetation) poses a danger in regions such as the Carmel whenever we have extreme weather conditions. In those cases it doesn’t matter if a fire starter would be caused by laziness or arson, things would still ignite very quickly, and such fires could cause a large scale disaster and would be very difficult to stop,” he said. The topography of the Carmel, with its many ‘hard-to-reach’ places also further exasperates the issue. “We need to budget appropriately to include proper care of the forests as well as more easily accessible wooded areas,” said Levy.